Hydrographia Germaniae qua Geographiae Naturalis - Homann, J.B. Title : Hydrographia Germaniae qua Geographiae Naturalis. Size : 19.1 x 22.8 inches. / 48.5 x 57.8 cm. 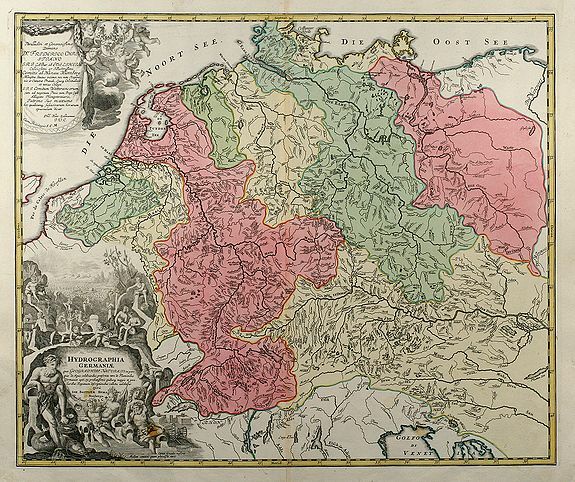 Description :Coloured map of the river system of Germany from J. B. Homann. With two beautiful cartouches. From "Grosser Atlas". Condition : Two wax spots in cartouche, excellent conditions.